Meet Amaund Motierre inside Volunruud and learn who he wants assassinated. Rexus hands over an Amulet. Meet Amaund Motierre inside Volunruud. Take his letter and amulet to Astrid. Take the amulet to Delvin Mallory. Return to Astrid with the letter of credit. When you last left the Dark Brotherhood sanctuary, Astrid was still in turmoil regarding your sudden promotion to Listener, and the ensuing duties the role required. Once you have fulfilled any of the contracts Nazir gave you after completing Whispers in the Dark (Narfi, Beitild, Ennodius Papius, Hern, Lurbuk), go back to the sanctuary. Astrid will approach you and tell you that she has finished thinking. She agrees that it would be madness to just ignore the Night Mother's demands and tells you to travel to Volunruud to meet with Amaund Motierre. When you enter Volunruud, a skeleton sits in a small alcove immediately to your left. It will attack you as you pass, so conduct a preemptive strike while it slumbers, or sneak past it. Near the skeleton are Heddic's Volunruud notes; reading them will start Volunruud's dungeon quest. Completing the quest gives you a word of Aura Whisper, a useful shout for assassins, but the quest is not necessary to meet Motierre. After the skeleton, the first room is straight ahead. There are three paths, but the one you want is the leftmost one. Open the door and you'll find the client waiting with Rexus, his bodyguard. Motierre will be impressed and a bit unnerved that you have arrived. He informs you that he has multiple targets in mind, all culminating in a shocking end--the assassination of the Emperor. The bodyguard will then give you two items: a valuable jeweled amulet "to cover expenses" and a sealed letter with further instructions to deliver to Astrid. Return to the sanctuary and deliver these items to Astrid. When you return, Astrid is anxious to know the goings-on. When you tell her of Motierre's grand design, she will be excited by the prospect of such glory for the Brotherhood and starts with preparations. She wants to study the letter further, but in the meantime, asks you to take the amulet to Delvin Mallory, a Thieves Guild member located at the Ragged Flagon in the Ratway in Riften. She wants the amulet appraised and sold, if Mallory is interested. Upon inspecting the amulet, Mallory will inform you that it is a one-of-a-kind item and is only given to members of the Elder Council. He agrees to purchase it and hands you a letter of credit, which is to be delivered to Astrid—as per their "standard arrangement". Return to Astrid with the letter. When you explain what Mallory told you about the amulet she will be delighted, musing that Motierre is probably a member of the Elder Council looking to get himself promoted. With that, she is all smiles and action; she informs you that the first step to completing the new directive will be for you to attend a wedding and assassinate the bride. If you read the letter Amaund Motierre gives you inside Volunruud before delivering it to Astrid, she will mention it in conversation after showing it to her, criticizing your actions as "sloppy". This has no effect on the quest other than the additional dialog. You can directly go to Volunruud rather than speaking to Astrid first, but the quest won't start until she talks to you. There is a chest in Amaund's chamber within the ruins which is free to loot, containing some leveled valuables and gold. If you go to Amaund before getting the quest, the quest will not be altered. If you return to the Sanctuary, Astrid will simply tell you to go to Volunruud before ending the conversation. Asking Astrid for more details on the wedding murder will have her speaking like the civil war is still ongoing, even if you've already completed that questline. 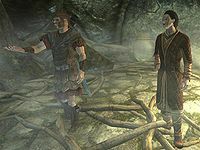 If you are a member of the Thieves' Guild when you take the amulet to Mallory, he will ask if the assistance you need is for the guild, prompting you to say it is for the Dark Brotherhood instead. 5 I returned to Nazir, but he directed me to speak with Astrid immediately. Perhaps she's made up her mind about me seeing Amaund Motierre in Volundruud. 10 Astrid has agreed to let me see Amaund Motierre in the dungeon known as Volunruud, as commanded by the Night Mother. I'm to speak with Motierre, and find out what he wants. 20 Amaund Motierre has commissioned the Dark Brotherhood to kill several people, all of which will lead to the assassination of a primary target - the Emperor of Tamriel himself. I am to report this information back to Astrid. 30 I've given Astrid the amulet and sealed letter provided to me by Amaund Motierre. I'm to take the amulet to a fence named Delvin Mallory, in the Riften Ratway - to gain any information I can, and sell it if Mallory is willing to buy. 40 Delvin Mallory has informed me that the amulet provided by Amaund Motierre indicates he is a member of the Emperor's Elder Council. Mallory was willing to purchase the amulet in exchange for a letter of credit, which I must now deliver to Astrid. 200 Finishes quest After meeting with Amaund Motierre, I learned he is a member of the Elder Council, and wants the Dark Brotherhood to kill several people, all of whom lead to a primary target - the Emperor himself. On the PC, it is possible to use the console to advance through the quest by entering setstage DB04a stage, where stage is the number of the stage you wish to complete. It is not possible to un-complete (i.e. go back) quest stages, but it is possible to clear all stages of the quest using resetquest DB04a.